The experience provided to NICA student-athletes is only possible because of the contributions of dozens of volunteers at each race. On behalf of our student-athletes, our coaches, league directors and the NICA team, we thank you for devoting time from your weekend and/or parents who spend time away from spectating your racing student-athlete, in support of high school and middle school mountain bike racing. Thank you also for taking the time to carefully read the guidelines for your position. Please email your volunteer coordinator or league director if you have any questions, feedback or concerns. Announcing invites all racers and all family into the action. This role allows the race announcer to be organized and keep up the energy level. You’ll be giving the announcer all the information he or she needs to announce athletes as they cross the finish line. The announcing assistant needs to be quick at calling the numbers as soon as they see them and then as they cross reference rider numbers with names and schools. 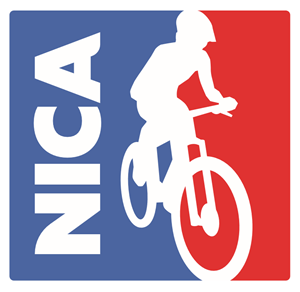 As a course setter you will be marking the course for NICA student athletes pre-riding and racing. With the direction of the Chief Course Setter or League Director, you will be placing markings to alert riders to turns, dangers and confirm they are on course. This involves you or your assigned course marking partner to ride your mountain bike with a backpack full of course-setting supplies: course tape, signs, zip ties and small wooden stakes. You’ll have fun getting out on course with some fellow League supporters. Come well prepared with your mountain biking gear and bring clothing for a range of weather, as well as sunscreen, snacks and drinks. Course Marshals have an active role in ensuring safety on the course. Course Marshals stand at key marshal points along the course to warn riders of hazards, direct riders, ensure fair play and provide rapid response to incidents. Course Marshals may also act as crossing guards and/or league representatives to other trail users. Radios are provided to communicate report any incidents or to call in medical assistance. A note pad is provided to keep track of any outside support, rule violations and riders who abandon the race. Course Marshals can hike or ride bikes to their marshal points. Lastly, remember to cheer on those riders as they pass by! Nutrition and hydration play key roles in keeping NICA students-athletes safe and performing their best on the course. Feeders are often team volunteers doing this team job for their first time. As Feed Zone Marshal, you will be guiding all the parent, coach and other volunteer feeders to keep the feed zone the ideal place for water and food hand-offs. The Feed Zone Marshal needs to have a good understanding of the NICA rules about the feedzone and carries this portion of the NICA rulebook. (These rules are printed below.) “Everyone take one step back,” “No running,” and “Only feeders in the feedzone” are a few phrases parents and coaches come to expect from the Feed Zone Marshal. Finish Line Support Volunteers ensure NICA Student Athletels finish stong and make a smooth transition from competing to reuniting with parents, coaches and teammates. The finish line is often the most hectic and is the most crowded part of the racecourse. Parents and teammates are crowding around to see their athletes finish and athletes come through exhausted, fatigued, and in need of someone to corral them out of the way. Finish line support volunteers allow athletes a clear, safe exit from the race course. A quick training session meeting at the finish line will orient you in this unique part of the course. Assist Registration Manager in collecting race paperwork, payments, and distributing race plate numbers to coaches and student athletes. The process is detailed so staying relaxed and focused is key. The Scoring Assistants provide a critical role to keep track of the action moment by moment using NICA’s proprietary scoring system. The Chief Scorekeeper will guide you and the rest of the team in the positions of Data Entry, Number Caller and Hand Jammer. Be sure to come prepared with appropriate layers for a range of weather, as well as snacks and water – we also recommend a hat and sunglasses. Staging Officials facilitate riders getting into their correct staging location before the start of each race. After signing up at the volunteer tent, Staging Officials arrive at the staging area riders 30 minutes before the start of each wave of race starts. Once at the staging area, Staging Officials confirm the league’s staging process with the Race Director, Operations Manager, Chief Official, or other Core Race Staff Volunteer. Equality in staging is ensured by the staging plan being clearly communicated before the race and carried out by Staging Officials. A Sweeper keeps track of a rider wave by riding behind the last rider. Course Marshals, Roving Course Marshals, Finish Line Support Crew, the Scoring Team and racers all look to the Sweeper to gauge where the last rider in a wave is positioned on course. The Sweeper and Course Marshals who will be on course together attend the same Course Marshal briefing before the race.